Canberra spider orchid seducing an unwitting thynnid wasp with the promise of a female wasp. Both creatures, wasp and orchid, engaged in deception and delusion for the purposes of procreation. Image: CSIRO/Jesse Hawley based on photographs from Tobias Hayashi. It’s Australian Pollinator Week! Time to celebrate honey and bees! Or is it? While much of the food on our plates would vanish without honey bees to pollinate our crops, honey bees barely deserve a walk on (or fly-in) role in the story of pollination. Australia has hundreds of native species of bees that pollinate our native plants. They are rivalled by our twenty-something-thousand species of flies. But not even flies are the stars of this story. Spoiler alert! This story is about thynnid wasps, insects with a complicated love life: handsome prince meets wingless female, carries female on joy flight, drops female back home, moves on. Female burrows underground, lays eggs in beetle larva. Wasp larvae hatch, eat beetle, leave home. Cycle repeats. 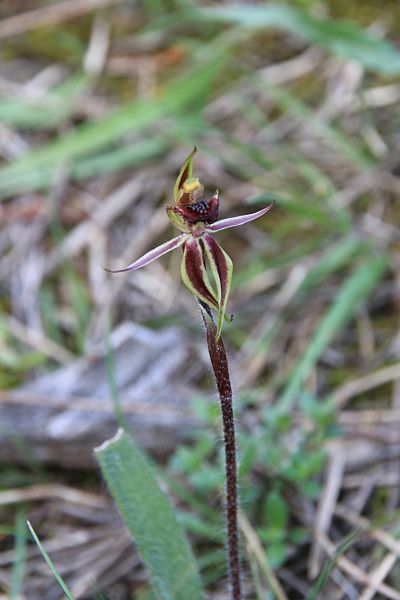 This story is also about Caladenia actensis, the Canberra spider orchid, the kind of rare plant that orchid hunters lose sleep over. This orchid is endemic to Canberra and survives in only two locations. The ACT Government has been keeping an eye on it for the past decade, with plans to increase the number of populations. But among the many hurdles to replenishing numbers was the big question: who or what is the pollinator? The riddle of what pollinates the Canberra spider orchid was solved in 2016 by Tobias Hayashi, then an honours student at the Australian National University. 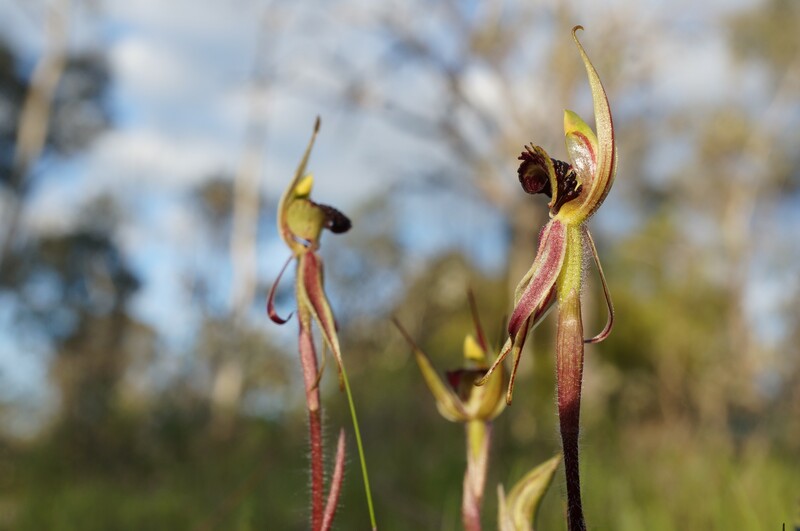 Many orchids, including other Caladenia species, trick different species of thynnid wasps into visiting their flowers, and this proved to be the case for the Canberra spider orchid. The exact species of wasp is one of Australia’s many undescribed insect species. It doesn’t yet have a name. Here’s how it works: in spring the Canberra spider orchid puts on a spectacular show of sight and smell for its unwitting pollinator. Using sexual mimicry, the orchid disguises its flower as a female thynnid wasp, both visually and using pheromones. Male thynnid wasps land on the flower, mistaking it for a female and picking up pollen as they attempt to carry it away, delivering pollen between the different plants they visit. Unlike when a honey bee visits a flower, there is no reward of nectar for the thynnid wasp, just a waste of time. The next hurdle was propagating the orchid. Orchids partner with mycorrhizal fungi in soil and won’t grow from seed unless the right species of fungus is present. 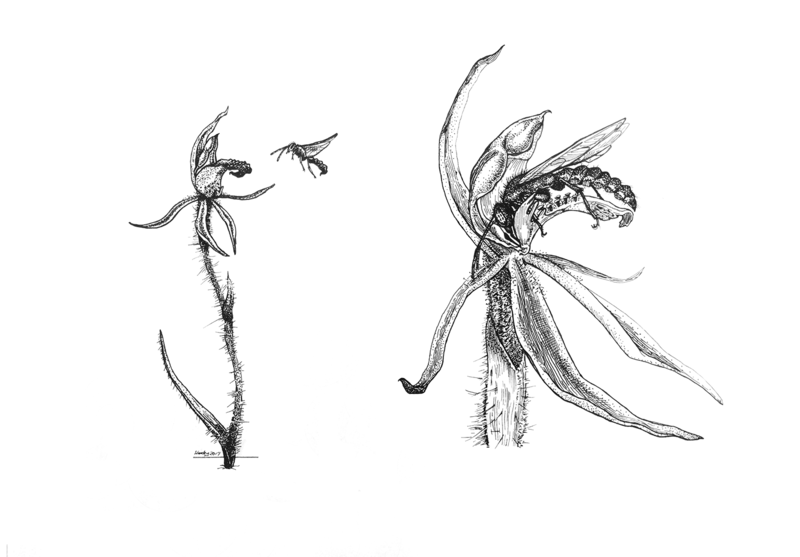 Luckily the Canberra spider orchid relies on a mycorrhizal fungus that is quite widespread. Seeds collected from the two existing populations have been successfully germinated by Cranbourne Botanic Gardens in Victoria. These plants are now growing in pots as part of the living collection at the Australian National Herbarium in Canberra. Based on habitat modelling, the ACT Government ecologists have chosen a nature reserve in north Canberra as a potential planting site. Over several years, their ecologists have run baiting trials, taking potted plants into the field to find out whether thynnid wasps were present and would pollinate the flowers. Fortunately for the orchid, thynnid wasps were happy to visit it in its new location; that is if happy is the right word for a wasp tricked into partnering with an orchid. The Australian National Herbarium is part of the Centre for Australian National Biodiversity Research, a joint venture between Parks Australia’s Australian National Botanic Gardens and CSIRO. Sounds of summer: why are cicadas so loud? Nice work and report. I know a cluster of these guys in CBR they are beautiful. Hope there is funding for a project like this!